Objective: The purpose of the study was to investigate if the use of tilted implants as distal abutments is biomechanically superior to the use of distal cantilevers. Methods: A 3-D edentulous maxillary model was generated from computed tomography images. Four implants were placed in the pre-maxilla and splinted with a titanium bar. Keeping the prosthesis length constant, six different configurations were evaluated with the distal implant varying in length (8 mm, 10 mm, 13 mm); angulation (0, 15, 30, 45°) and abutment angulation (0, 17, 30°). A vertical load (120 N) was applied on the titanium bar corresponding to the position of the left second premolar abutment. Von Mises stress values transmitted to the peri-implant bone and implant abutment junction were evaluated. Results: The maximum stresses recorded at the peri-implant bone and the implant abutment junction were 5.821 MPa and 8.261 MPa for 8 mm vertical implant; 5.358 MPa and 8.131 MPa for the 10 mm implant; and 4.897 MPa and 7.754 MPa for the 13 mm vertical implant. Tilted distal implants resulted in increased stress values for all variables: 8.906 MPa, 8.938 MPa and 8.994 MPa at the peri-implant bone and 14.636 MPa, 15.567 MPa and 16.872 MPa at the implant abutment junction for 15, 30 and 45° respectively. Conclusion: An increase in implant length resulted in a decrease in the stresses, whereas the tilted distal implants and abutments increased the stresses at the peri-implant bone and implant abutment junction of the implants. For edentulous individuals who have difficulty in adapting to complete dentures, rehabilitation with implant supported prosthesis offers considerable functional and psychosocial advantage. However, cases with inadequate bone volume may result in difficulty in placement of implants . Clinical management may include surgical correction, such as bone augmentation of the alveolar ridge, sinus elevation, or nerve repositioning  or bypassing the maxillary sinus and stabilizing implants in the zygomatic process . However, each of the above mentioned techniques have several disadvantages [2,3]. When sinus lift is not an option, several other treatment alternatives can be considered, including adding a distal cantilever of one or two units, tilting a long implant to support the posterior portion of the prosthesis, or placing a short implant to support the posterior portion of the prosthesis . The conventional protocol is the placement of vertical implants, splinted together with a fixed prosthesis . This type of prosthesis is made with posterior cantilevers to provide the patient with molars. The most distal implants are placed in the premolar region. Currently, several authors have studied and reported on the use of distal tilted implants [6-12]. Tilting allows for the placement of longer implants, which increases the degree of implant to bone contact area and also the implant primary stability . The compromised bone of the sinus antrum can be circumvented, thereby, reducing the cantilever length with an equivalent number of masticatory units, giving rise to reduction in the moments of force and thus improving the load distribution [14-16]. The tilted implants require angle corrected abutments/preangled abutments which aid the clinician in avoiding anatomical structures when placing the implants . However, the stress induced through preangled abutments at the cervical zone of the implants due to moments can be a dominant factor influencing the success of the restoration. Vertical and transverse loads from mastication induce axial forces and bending moments and result in stress gradients in the implant as well as in the bone. Stresses are more concentrated in the coronal portion of an impant. Neural receptors of the periodontal ligament are essential for oral tactile function. They are responsible for active tactile sensibility, i.e, the discriminatory ability to detect occlusal thickness. Passive tactile sensibility, i.e, the detection threshold of pressure, as well as inhibitory reflexes is dependent on the presence of periodontal receptors. Therefore, in patients with partial or complete loss of teeth and subsequently loss of the periodontal ligament in the respective area, reduced active and passive tactile sensibility may be assumed. Otherwise, due to the lack of an inhibitory-reflex mechanism, higher maximal bite forces could be expected when teeth are replaced by implants . Load transfer from implants to surrounding bone also depends on the type of loading, the bone-implant interface, the length and diameter of the implants, the shape and characteristics of the implant surface, the prosthesis type, and the quantity and quality of the surrounding bone [19,20]. Finite element analysis allows researchers to predict stress distribution in the contact area of the implants with cortical bone and around the apex of the implants in trabecular bone. Many of the previous finite element studies examined the effects of varying the implant length, [14,21-27] angulation [3,10,28,29,30-35] and abutment angulation [36-42] on stress distribution around implants in completely and partially edentulous jaws. The present study was conducted to compare and evaluate the stress distribution pattern at implant bone interface and implant abutment interface with different implant length, implant angulation and abutment angulation in maxillary fixed prosthesis using three dimensional finite element analyses. Three dimensional finite element models of maxilla and the implants were constructed on a personal computer with Intel Core 2 Duo Processor, 4 GB RAM, 320 GB hard disk using a series of computer software programmes - Materialise Interactive Medical Image Control System Version 8.11 (MIMICS), Hypermesh Version 10.0 and Analysis System Version 12.1 (ANSYS) (Figure 1). Material properties were taken from the literature (Table 1). The model was divided into large number of elements and nodes. An overview of the meshes used in study and the number of elements and nodes for each model is given below (Table 2). Table 2: Number of nodes and elements for each model. The bone was simulated to be of D2 density (dense to thick porous compact bone on the outside and coarse trabecular bone on the inside) in the anterior region and D3 (porous compact and fine trabecular bone) in the posterior region of the maxilla. The implant model was generated using Computer Aided Reverse Engineering (CARE). CARE creates a computer model of an object through measurements of the tangible object, as it exists in the real world using a laser based range scanner. This model is metrically accurate within the acceptable limits. The implant assembly consisted of Nobel Replace Tapered implants having internal tri-channel connection with a regular platform, 16 mm length, 4.3 mm diameter; and Multi Unit abutments of 4 mm length. The titanium bar used was 85 mm in length, 3 mm in thickness and 10 mm in width. The first step was measuring at the points along the surface of the implant, screw, the abutment and the titanium bar using vernier callipers. Each point has an x, y and z coordinate locating the point in 3D space. The collection of these points is known as a point cloud (Figure 2). 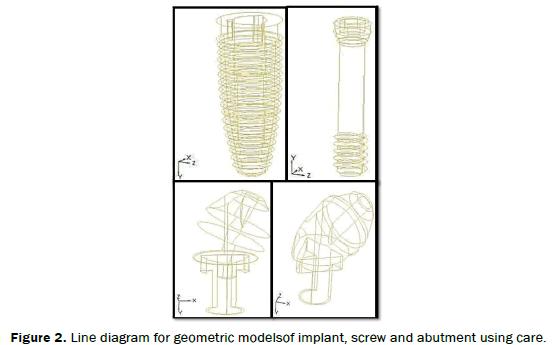 Figure 2: Line diagram for geometric modelsof implant, screw and abutment using care. The point cloud and the detected features were then used by the CARE system to model the entire geometry of the implant, screw, abutment and the titanium bar (Figure 3). Figure 3: Model of the screw, implant (showing internal tri-channel connection) and abutments (straight, 17 degree angulated and 30 degree angulated abutments). Implant models of lengths 11.5 mm and 13 mm were generated keeping the diameter of the implant constant (Figure 4). Figure 4: Models of 8 mm, 10 mm, 11.5 mm, 13 mm and 16 mm length implants with 4.3 mm diameter and internal tri-channel connection. Six configurations were generated. In each configuration, the implants of 13 mm length were placed vertically (perpendicular to occlusal plane) in the right canine region (B) and left canine region (C) and 11.5 mm length implant was placed in the right second premolar region (A). In the first three configurations, the distal implant (D) length varied to 8 mm, 10 mm and 13 mm which were placed vertically with a straight abutment in the left second premolar region. In the fourth, fifth and sixth configuration, an implant of 16 mm length was placed at an angulation of 15, 30 and 45° in the left second premolar region (D) with the abutment angulated at 17, 30 and 30° respectively (Figure 5 and Table 3). Figure 5: Configuration I (8 mm vertical implant), II (10 mm vertical implant), III (11.5 mm vertical implant), IV (16 mm implant with 15 degree angulation), V (16 mm implant with 30 degree angulation) and VI (16 mm implant with 45 degree angulation). Table 3: Features of prosthesis used in 3-D FEA. After the placement of all the implants, the titanium beam was attached onto the abutments. A vertical load of 120 N was applied on the titanium bar corresponding to the position of the left second premolar abutment (Figure 6). Figure 6; Load of 120 N applied vertically. colour coded display of the pattern of von Mises stress at the implant abutment junction and the implant bone junction was made. The colour coding used in the study depicted red as maximum and blue as minimum and the shades in between showed variation of stresses from maximum to minimum. The maximum stresses recorded at the implant bone and implant abutment interface with varying implant and abutment angulation (Table 4). Table 4: Stresses at implant bone interface and implant abutment junction of the left second premolar for all the configurations. When the four implants were splinted with a rigid fixed prosthesis, stresses at the peri-implant bone and the implant abutment interface decreased as the implant length increased. Whereas, there was an increase in the von Mises stresses at the periimpalnt bone and the implant abutment junction with an increase in the implant tilt and the abutment angulations (Graphs 1-6). Graph 2: Von Mises Stress Contours at implant abutment interface (MPa) with Zero degree implant angulation. Graph 3: Von Mises Stress Contours at implant abutment interface (MPa) of the contralateral implant with increasing implant. Graph 4: Von Mises Stress Contours at implant bone interface (MPa) with constant implant length (16 mm). Graph 5: Von Mises Stress Contours at implant abutment interface (MPa) with constant implant length (16 mm). Graph 5: Von Mises Stress Contours at implant abutment interface (MPa) on the contralateral side with changing implant angulation on the left side. Finite elemental analysis (FEA) is a useful tool for investigating biomechanical interactions of various designs. FEA allows investigators to predict stress distribution in the contact area of the implants with bone using a mathematical model of the structures. Although there have been numerous reports documenting implants with 3D finite element models, few researchers have examined the influence of implant inclination and abutment angulation on the implant abutment interface in maxilla. Tilted implants and angulated abutments can be used when the anatomic limitations preclude the axial placement of an implant. A shortened cantilever and the subsequent decrease in stress concentration around the anterior implants during posterior loading are the advantages of the tilted posterior implant design. However, these advantages are created at the expense of tilting posterior implants and imposing higher stresses on them. As the stress on the surrounding bone is greatly influenced by loading direction and implant inclination, great care should be taken that the load be applied vertically, or atleast near the long axis of the implant. Six models were generated in the present study, with each model simulating the all-on-four concept of rehabilitation of completely edentulous maxilla. The principle behind the all-on-four concept is the placement of two straight implants in the anterior and two angled implants in the posterior region. The angled posterior implants help avoid relevant anatomical structures, can be anchored in better quality anterior bone and offer improved support of the prosthesis by reducing cantilevers. They also eliminate the need for bone grafting by increasing the bone to implant contact and preserve the vital structures as well . In this study a force of 120 N was applied axially on the titanium bar corresponding to the position of the left second premolar abutment. These loads represent the average means recorded on patients with endosseous implants which is in accordance with many previous studies [18,25]. Tada  applied a force of 100 N axially to the occlusal node at the center of the abutment in order to evaluate the influence of implant design and bone quality on stress distribution on bone around vertical and angled implants. In the present study, tilted distal implants rigidly splinted with a fixed prosthesis, increased peri-implant bone stresses as compared to a vertical implant model with cantilevered segments, which has been supported by Weinberg . He stated that for every 10° increase in implant inclination, there was approximately a 5% increase in implant/prosthesis loading. Canay  found that with the vertical loading, the compressive stress values were found to be five times higher around the cervical region of the angled implant (12 MPa) than around the same area in the vertical implant (2 MPa). These findings were also supported by Caglar , Naini , Baggi , Ueda , Watanabe  and Begg , who reported an increased stress concentration at the coronal region with an increase in implant inclination. This is because the deflections and stress concentrations generally increase with an increase in either the magnitude or angle of the load. Thus when vertical loads are applied to vertical and angled implants, there is only apical migration in vertical implants, but there is a significant deflection coupled with some apical migration in angled implants. But these results were contrary to the findings of the study conducted by Bevilaqua [29,34] who found that the use of distal tilted implant results in a reduction in stresses in the peri-implant bone. He found that the maximum stress value recorded in compact and cancellous bone for the vertical implants were 75.0 MPa and 68.6 MPa for distal implants respectively. Whereas, for the 45° distal tilted implants, the maximum stresses were reduced to 19.9 MPa for compact bone and 15.5 MPa for cancellous bone. Furthermore, Krekmanov et al. [6,34] reported the efficacy of distally inclined implant placement in enlarging the supporting area of the occlusal face. They stated that the rigidity of the prosthesis may counteract any bending moments registered at the abutment level, provided the implant is part of a restoration structure. The implant is tilted in the mesiodistal direction, which is in the plane of the model, and any oblique forces and stresses would be of a second order of magnitude in this case . At the implant abutment junction also there was an increase in the maximum stresses with an increase in the implant tilt. In the present study, the stresses at the peri-implant bone decreased with an increase in implant length. Findings from Petrie et al. are in agreement with the results from this study showing that increasing length caused as much as a 1.65-fold reduction in stresses. These results were in accordance with the study conducted by Himmlova , Meijer , Guan  who found that the stresses decreased within the cancellous bone and cortical bone as the implant length increased. This is because the surface area contact between the bone and implant also increased, leading to the implant absorbing more of the load. Similar results were found in other previous studies conducted by Baggi , Ogawa , Kong et al. .
At the implant abutment junction also there was a decrease in the maximum stresses with an increase in implant length. Preangled abutments were used to overcome non-ideal implant location due to bone structure. In the present study, the stresses at the implant bone interface and at the implant abutment junction increased with angulated abutments as well. The results were similar to those for tilted implants as depicted in Table 4. These results were in accordance with the study conducted by Clelland,  who found that compressive stress nearly doubled as the abutment angulation changed from 0 to 20°. Brosh  and Begg et al. also verified that vertical loads applied in angled abutments produced higher stresses at the coronal zone of the implant compared with straight abutments. However, there are certain limitations in the present study. The ideal condition of 100% osseous integration between implants and bone was assumed. The stress analysis were performed assuming a concentrated static load and the living tissues were modeled as isotropic linearly elastic materials, distinguishing two homogenous material volumes for describing the trabecular and cortical regions. These assumptions do not represent actual clinical conditions because of possible osseointegration defects at the peri-implant region and time dependent, functionally distributed forces, as well as anisotropic, nonhomogeneous and nonlinear responses of bone. Future research should include evaluation of oblique forces on restorations supported by tilted implants as well as incorporation of implants tilted in a buccolingual direction. Modeling the bone as an anisotropic and nonhomogeneous regenerative tissue that responds to stress by resorption or regeneration under load would also be an improvement in current finite element models to address the issues found in this study. The von Mises stresses decreased at the peri-implant junction and at the implant abutment interface with an increase in implant length. The von Mises stresses increased at the peri-implant junction and at the implant abutment interface with an increase in implant tilt. The von Mises stresses increased at the peri-implant junction and at the implant abutment interface with an increase in the angulation of the abutment. Lundgren D, et al. Occlusal force pattern during mastication in dentitions with mandibular fixed partial dentures supported on osseointegrated implants. J Prosthet Dent. 1987;58:197-203. Misch C. Maxillary sinus lift and elevation with subantral augmentation. In: Misch C, Contemporary Implant Dentistry. (2nd eds), Mosby, St. Louis.1993. Zampelis A, et al. Tilting of splinted implants for improved prosthodontic support: A two dimensional finite element analyses. J Prosthet Dent. 2007;97:S35-S43. Ogawa T, et al. Effect of tilted and short distal implants on axial forces and bending moments in implants supporting fixed dental prosthesis: An in vitro study. Int J Prosthodont. 2010;23:566-573. Zarb GA, et al. Osseointegration: on continuing synergies in surgery, prosthodontics and biomaterials. Quintessence, Hanover Park.2008. Krekmanov L, et al. Tilting of posterior mandibular and maxillary implants for improved prosthesis support.Int J Oral Maxillofac Implants. 2000;15:405-414. Malo P, et al. All-on-4-immediate function concept with Branemark System implants for completely edentulous maxillae: A 1-year retrospective clinical study. Clin Implant Dent Rel Res. 2005;7:S88-S94. Naini RB, et al. Tilted or parallel implant placement in the completely edentulous mandible? A three dimensional finite element analysis. Int J Oral Maxillofac Implants. 2011;26:7767-7781. Kim KS, et al. Biomechanical comparison of axial and tilted implants for mandibular full arch fixed prostheses.Int J Oral Maxillofac Implants. 2011;26:976-984. Baggi L, et al. Implant-bone load transfer mechanisms in complete-arch prostheses supported by four implants: A three dimensional finite element approach. J Prosthet Dent. 2013;109:9-21. Monj A, et al. Marginal bone loss around tilted implants in comparison to straight implants: a meta-analysis.Int J Oral Maxillofac Implants. 2012;27:1576-1583. Calandriello R and Tomatis M. Simplified treatment of the atrophic posterior maxilla via immediate/early function and tilted implants: A prospective 1-year clinical study. Clin Implant Dent Rel Res. 2005;7:S1-S12. Aparicio C, et al. Tilted implants as an alternative to maxillary sinus grafting: A clinical, radiologic, and periotest study. Clin Implant Dent Rel Res. 2001;3:39-49. Fabbro MD, et al.Tilted implants for the rehabilitation of edentulous jaws: a systematic review. Clin Implant Dent Rel Res. 2012;14:612-621. All- On- 4TM. Treatment concept for edentulous arches. Sweden: Nobel Biocare.2010. Begg T, et al. Stress patterns around distal angled implants in the all-on-four concept configuration. Int J Oral Maxillofac Implants 2009;24:663-671. Cavallaro J and Greenstein G. Angled Implant Abutments: A Practical Application of Available Knowledge. J Am Dent Assoc. 2011;142:150-158. Stern RM, et al. Occlusal force and oral tactile sensibility measured in partially edentulous patients with ITI implants. Int J Oral Maxillofac Implants. 1995;10:345-354. Caputo AA andStandlee. Biomechanics in clinical dentistry. Quintessence, Chicago. 1987. Duyck J, et al. Magnitude and distribution of occlusal forces on oral implants supporting fixed prostheses: An in vivo study. Clin Oral Impl Res. 2000;11: 465-475. Himmlova L, et al. Influence of implant length and diameter on stress distribution: A finite element analyses. J Prosthet Dent. 2004;91:20-25. Baggi L, et al. The influence of implant diameter and length on stress distribution of osseointegrated implants related to crestal bone geometry: A three dimensional finite element analyses. J Prosthet Dent. 2008;100:422-431. Petrie CS and Wiliams JL. Comparative evaluation of implant designs: influence of diameter, length, and taper on strains in the alveolar crest: A three-dimensional finite-element analyses. Clin Oral Impl Res. 2005;16:486-494. Meijer HJA, et al. Stress distribution around dental implant: Influence of superstructure, length of implants, and height of mandible. J Prosthet Dent. 1992;68:96-102. Sertgoz A and Guvener S. Finite element analyses of the effect of cantilever and implant length on stress distribution in an implant-supported fixed prosthesis. J Prosthet Dent. 1996;76:165-169. Guan H, et al. Influence of bone on dental implant parameters on stress distribution in the mandible: A finite element study. Int J Oral Maxillofac Implants.2009;24:866-876. Kong L, et al. Bivariate evaluation of cylinder implant diameter and length: A three-dimensional finite element analyses. J Prosthodont.2006;17:286-293. Caglar A, et al. Effects of mesiodistal inclination of implants on stress distribution in implant-supported fixed prostheses. Int J Oral Maxillofac Implants.2006;21:36-44. Bevilacqua M, et al. The influence of cantilever length and implant inclination on stress distribution in maxillary implant-supported fixed dentures. J Prosthet Dent. 201;105:5-13. Canay S, et al. Comparison of stress distribution around vertical and angled implants with fínite-element analyses. Quintessence Int. 1996;27:591-598. Ueda C, et al. Photoelastic analyses of stress distribution on parallel and angled implants after installation of fixed prostheses. Braz Oral Res. 2004;18(1):45-52. Weinberg LA and Kruger B. A comparison of implant/prosthesis loading with four clinical variables. Int J Prosthodont. 1995;8:421-433. Watanabe F, et al. Finite element analyses of the influence of implant inclination, loading position, and load direction on stress distribution. Odontology. 2003;91:31-36. Bevilacqua M, et al. Three-dimensional finite element analyses of load transmission using different implant inclinations and cantilever lengths. Int J Prosthodont. 2008;21:539-542. Satoh T, et al. Biomechanical rationale for intentionally inclined implants in the posterior mandible using 3 D finite element analyses. Int J Oral Maxillofac Implants. 2005;20:533-539. Kallus T, et al. Clinical evaluation of angulated abutments for the Branemark System: A Pilot Study.Int J Oral Maxillofac Implants. 1990;5:39-45. Eger DE, et al. Comparison of angled and standard abutments and their effect on clinical outcomes: A preliminary report. Int J Oral Maxillofac Implants. 2000;15:819-823. Saab XE, et al. Effect of abutment angulation on the strain on the bone around an implant in the anterior maxilla: A finite element study. J Prosthet Dent. 2007;97:85-92. Clelland NL, et al. A photoelastic and strain gauge analyses of angled abutments for an implant system. Int J Oral Maxillofac Implants. 1993;8:541-548. Balshi TJ, et al. Three-year evaluation of Brånemark implants connected to angulated abutments. Int J Oral Maxillofac Implants.1997;12:52-58. Sethi A, et al. The use of angulated abutments in implant dentistry: Five-year clinical results of an ongoing prospective study. Int J Oral Maxillofac Implants.2000;15:801-810. Brosh T, et al. The influence of abutment angulation on strains and stresses along the implant/bone interface: Comparison between two experimental techniques. J Prosthet Dent. 1998;79:328-334.